It was May 1979, and pouring rain so my Cornell medical school graduation had to be moved indoors to one of the Lincoln Center auditoriums. 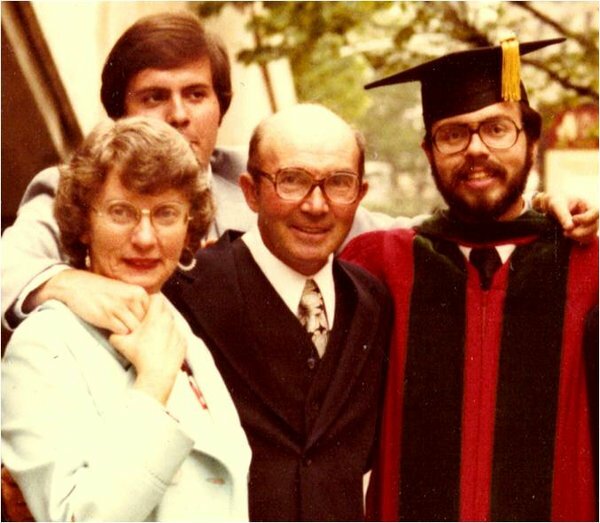 My Mom and Dad and younger brother were there all the way from Denver to watch me receive my diploma and take the Hippocratic Oath as a new doctor. This was my parents’ first time in New York. Dad hadn’t traveled much since the “big trip” to America from Poland. He was an Auschwitz survivor (No. 142178 tattooed on his arm) who lost his parents and sister in the concentration camps. My father had enough strength left to be selected for labor by the Nazis, and survived until liberation. On cue, the graduation speakers read their parts: “It was only four short years ago …,” “The experiences we had, the friendships we made.” ‘’Pomp and Circumstance’’ played, tassels were flipped, mortarboards flew in the air. The emotion I felt during the ceremony, however, was nothing compared with what happened afterward when I waded through the crowd to find my family near the center of the lobby. Hundreds of doctors, parents of doctors, friends of doctors and professors of doctors were milling about. This should have been the ultimate intimidating environment for my father. After hugs from my brother and Mom, I moved on to Dad. What happened at that moment I will never forget. Crying loudly, Dad fell to his knees in what can only be described as a total emotional breakdown. He shook and shivered and sobbed. People all around turned to stare, but he didn’t notice or didn’t care. The usual self-consciousness was gone. As I dropped to my knees to face him, he held me like never before. Everyone backed away to give us space; a few applauded. Strangers took pictures. Dad and I stayed on our knees, crying and hugging for a long time, until we both had the strength to stand up. Then, holding onto each other and to my Mom and brother, we made our way out of the auditorium. We didn’t stop at the reception for cookies or punch. We just kept walking until we felt the rain on our faces. Next Next post: GOTTA LOVE THOSE CATHOLIC PRIORITIES! What a beautiful and heartwarming story. He died truly a free man. His legacy of strength and courage will, no doubt, live on his children and grandchildren.